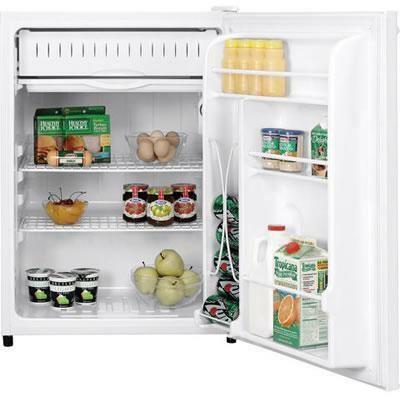 5.7 cu.ft GE spacemaker® compact refrigerator features two Mini Ice 'N Easy trays and color-matched visor handles. Total 5.7 cu. ft. / 0.16 cu. m.
Refrigerator 5.2 cu. ft. / 0.15 cu. m.
Freezer 0.5 cu. ft. / 0.01 cu. m.
Technologies Manual defrost; 2 Mini Ice N' Easy Trays. 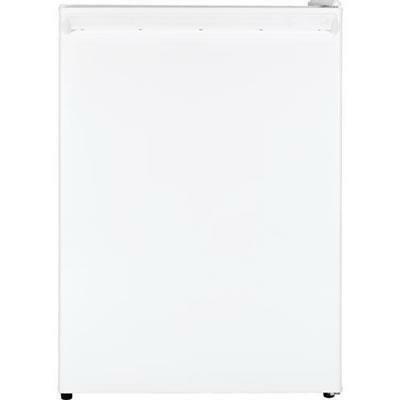 Additional Information Defrost Type: Manual; 2 Fresh Food Cabinet Shelves; Fresh Food Cabinet Shelf Features: 1 Adjustable, 1 Wire Adjustable; Fresh Food Door Shelves: 1 Full-Width, 2 Half-Width; Fresh Food Features: Interior Lighting - Incandescent; Custom Trim Kit: TPK7 (Optional); Door Swing: Reversible Hinges; Handle: White Visor. Additional Dimensions Overall Depth: 24 1/8 in; Case Depth Without Door: 20 7/8 in; Depth with Door Open 90°: 45 5/16 in; Height to Top of Case: 32 5/16 in.